Taste test: These chips had the same thick cut and extreme crunch as the other Tim's chips, with an intense Habanero flavor featuring a delayed heat. 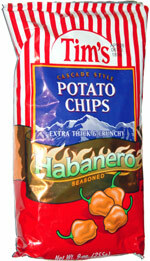 I've eaten hotter habanero chips, but these were quite tasty, with a good mix of potato and habanero tastes. The heat grew more intense by eating several chips in succession. Our tasters emptied this large bag in near-record time. Smell test: Smells peppery, maybe slightly hot. This snack was discovered by Jeremy at Albertson's. Review published .